By far, the easiest resolution I’ve kept since the beginning of this year was to eat healthier snacks. While that can be interpreted many ways, I see it as eating more fruits and veggies instead of chips or candy — a biggie since I mindlessly chomp away on something while working on the computer. And while I don’t like to indulge in milkshakes very often, I love the occasional thick-and-hefty smoothie that I make at home. But with my busy schedule and my distain for cleaning the blender, I usually end up going out for my smoothies. If that smoothie will be replacing a meal (which happens quite often), I prefer eating something even more substantial like smoothie bowls. Okay, so I admit that was a stretch from milkshakes to smoothies bowls but hang in there with me. Smoothie bowls are available at Robek’s Juice. You get all the benefits of yogurt — hello probiotics! — blended with fruit and all eaten with a spoon. There’s not a straw in sight. The smoothie bowls were created right here in San Diego by Robek’s franchise owner Dennis Sato, a retired engineer with a passion for eating healthy. 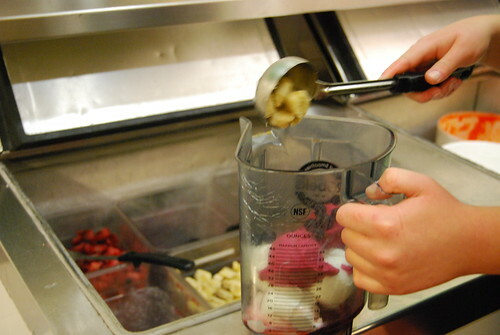 While experimenting with hard-pack yogurt, fruit and juice, Dennis came up with a smoothie you eat with a spoon. On a rainy day, he noticed a crowd of people hanging around a frozen yogurt shop and took it upon himself to create something similar with all the benefits of a smoothies. His smoothie bowl has the smoothness of ice cream but with no milky tongue residue that can be felt after eating ice cream or any other milk-based product that include emulsifiers. 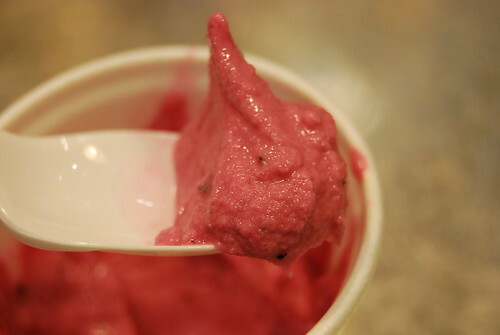 It’s light and refreshing with no artificial aftertastes I usually detect after eating frozen yogurt. All smoothie bowls come in the same flavors as their smoothies. Berry-based flavors include my favorite, Infinite Orange (orange juice, strawberries, nonfat yogurt blended with ice) while the power-based options are loaded with protein, calcium, fiber and a host of other nutritional add-ons to customize it. If you’re looking for a more decadent flavors, there are also coffee-based bowls that taste like a healthier alternative to ice cream. And if you’re like me and like a bit of texture, optional toppings include granola, trail mix and fruit. Calories depend on flavor but most range from mid 100s to low 200s. Robek’s franchises can be found here. Now here’s you chance to win a $20 giftcard to Robek’s to try anything in the store. Aside from smoothies and smoothie bowls, they also sell sandwiches, muffins and wheat grass shots that you can either have as-is or incorporated into a drink. Leave a comment on your favorite healthy snack and I’ll randomly select one person. Contest ends February 11. Good luck! Congratulations to the 10th person who responded — Rodzilla! Using Random.org, it randomly selected one of out 12 comments — yes, only 12. Please email me your address and I’ll get the gift card out to you. Disclaimer: All opinions are my own. I was not compensated for this review. I never knew about their smoothie bowls. I will definitely need to try one ASAP! My favorite healthy snack is sliced apples. Sweet AND crunchy! I want a gift card! The healthiest snack I eat are pita chips with hummus dip. I don’t like carrots. Given my love for froyo and all other frozen options I’m going to have to try this place out. I’ll often times make protein puddings for a “healthy” option. pretty low cal, tasty, and filling. There’s a Robek’s in my neighborhood, but I’ve never gone. Smoothie bowls like an excellent creation. My favorite healthy snack? I’d say either a handful of almonds or celery with peanut butter. My favorite healthy snack is greek yogurt and almonds. ooh, i’ve never tried robek’s before. Hmm… when I get motivated I cut up a bunch of celery and then eat a few sticks with almond butter. The celery is really more like an edible spoon getting almond butter to my mouth. I’m also a fan of pistachios, since you can’t just shovel a handful into your mouth. You have to take the time to open the shell first. And, sometimes you have to use part of a shell to pry open a pistachio shell that hasn’t been cracked enough. And I like mini Babybel cheese because it’s wrapped in wax. i love making smoothies with spinach, soy milk, and bananas. thats my new healthy snack. I like bananas (that are just barely ripe), Fuji applies and cashews (in moderation). My favorite healthy snack has got to be mango — dried or fresh or blended into a smoothie with frozen banana and berries. Yum! im a pumpkin fiend, i love pureed pumpkin with greek yogurt or even pb and pumpkin sandwiches on whole wheat, i just add maple syrup and cinnamon. Smoothie bowls are a really interesting idea! I’m a fan of the frozen yogurt craze that still persists, so smoothie bowls are appealing to me. It’s great that you can add toppings to make it more substantial.